Written specifically for nurse anesthetists, Nurse Anesthesia, 5th Edition provides comprehensive coverage of both scientific principles and evidence-based practice. It offers a complete overview of anatomy, physiology, pharmacology, and pathophysiology, and offers practical coverage of equipment and anesthesia management. This edition includes updated information on pharmacokinetics, clinical monitoring, drug delivery systems, and complications, and revises chapters on airway management and anesthesia for cardiac surgery. 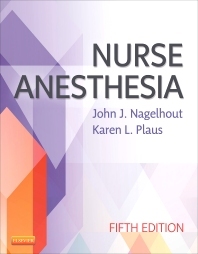 Written by leading nurse anesthesia experts John Nagelhout and Karen Plaus, this perennial bestseller prepares anesthesia students and CRNAs for today's clinical anesthesia practice. Over 650 figures of anatomy, nurse anesthesia procedures, and equipment depict complex concepts and information. An easy-to-use organization covers basic principles first, and builds on those with individual chapters for each surgical specialty. UPDATED references make it quick and simple to find the latest and most important research in the field. Over 700 tables and boxes highlight the most essential information in a quick, easy-to-reference format. UPDATED pharmacology information includes pharmacokinetics, drug delivery systems, opiate antagonists, and key induction drugs. 2. Nurse Anesthesia Specialty Practice and Education in the United States NEW!